Litten & Lycanroc by Pokémon, Nintendo, Game Freak. Midday- "I wanted that bed. <:("
MMidnight- "Hmm, fee;s softer than usual." Midday- "I wanted that bed. <:(" MMidnight- "Hmm, fee;s softer than usual." Especially since Lycanroc resists fire. Will these continue after Friday? This one is hilarious omg i loved this one!! Awww, poor Lycanroc (Midday Form) wants to use the cozy pillow as bed for sleep so Litten is there and steal the bed from Lycanroc (Midday Form) and he thought that Litten is looks like a boss cat. 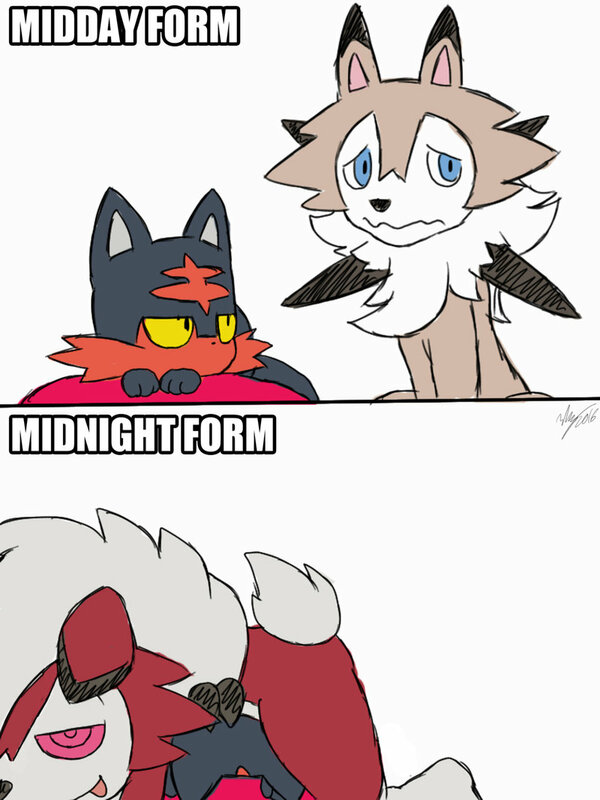 Ouch, Lycanroc (Midnight Form) is lie on Litten from stealing the cozy pillow as bed from Litten that Lycanroc (Midnight Form) don't care about waiting for Litten is here.